We often hear that our healthcare system is broken, but don’t see the physicians who are broken into it. “Code Black” gives viewers an inside look into one of the most high-pressure and high-stakes medical environments: the emergency room. Originally published August 6, 2014 on MedTech Boston. This is the question newly-released documentary Code Black asks of its audience, and the question each emergency room doctor in the film struggles to answer. We often hear that our healthcare system is broken, but don’t see the physicians who are broken into it. “Code Black” gives viewers an inside look into one of the most high-pressure and high-stakes medical environments: the emergency room. And not just any emergency room. The film looks at “C-Booth,” the trauma bay of Los Angeles County Hospital, which is called the “birthplace of emergency medicine”—a medical specialty that only emerged in the last half century—and sees an incredibly high volume of patients. In the film, a map of the U.S. shows hospital emergency rooms, and then, the dots on the map dwindling, the number of public hospital emergency rooms. The latter are the only ones that guarantee care without insurance. This means that undocumented immigrants, people without insurance, or people with poor insurance flock to public hospitals like LA County, sometimes many hours away, just to get treatment. Doctors at public hospitals find themselves routinely treating patients who have waited 18 hours in a jam-packed waiting room. The documentary lets you see, hear, and experience the anguish of the patients who wait, including some who end up leaving because they’ve waited too long. You see doctors scrolling through a spreadsheet of hundreds of patients, ranking the urgency of treatment and getting increasingly frustrated as wait times climb upwards to a code black – the highest capacity an emergency room can handle, with wait times at or above 24 hours. 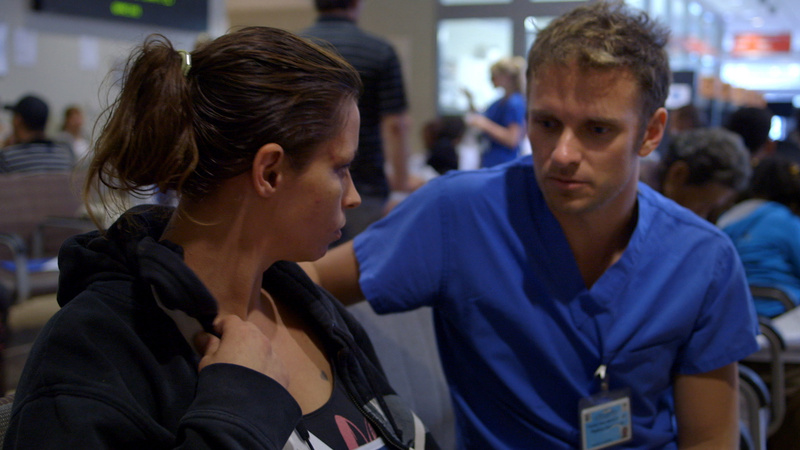 The director of the film, emergency medicine doctor Ryan McGarry, filmed this documentary while completing his residency in C-booth, juggling both a camera and his full resident schedule. The film shows his experience starting out at C-booth while it was in an old, small building and under less administrative scrutiny. In those early scenes of C-booth, you watch an organized chaos of 30 or so people swirling around patient beds, all in the same small space. Then you see a quick transition to the new, shiny hospital building, a place with separate patient rooms and provider work areas. You watch physicians spend precious time filling out form after form, complaining about an endless sea of paperwork. The film portrays the new, supposedly better system as full of mundane tasks piling up for the physicians. In one scene, McGarry whispers into the camera. He says a nearby patient needs a certain test, but that test requires him to fill out three copies of a form, and he finds himself dragging his feet on ordering the test: not because he doesn’t want to, but because the paperwork is so irritating. “That’s f-d up,” he says. That’s one thing that’s unique about this film – the doctors recognize their heroism and their ideals, but also their limitations. They try to work as best as they can within a confining system, but it frustrates them to feel they are not doing their best for their patients. In the film, you watch the young doctors try to innovate. They change the layout of the emergency room to improve efficiency. We feel a rush of excitement about these ideas – they may work – but then we hear from an administrator. There aren’t enough nurses. The project gets shut down. In medicine, the consequences of innovation have high stakes. So are doctors, looking over their shoulders at the specter of malpractice, going to be the ones to change the system? Or hospitals? Or the government? Read the rest of the article here on the site MedTech Boston.